The University of Illinois at Chicago’s faculty union says it is set to strike February 18-19 if a bargain cannot be reached between union negotiators and school administration. We talk with union president Joe Persky and Chicago Tribune reporter Jodi S. Cohen about the matter, and what can be expected in the coming weeks. Read an interview with Union President Joe Persky. What are faculty members most frustrated by? The lecturers’ condition of work is terrible and multiple faculty members operate in an office without a computer. We want better work conditions. For tenured professors, conditions are better but we have a long-standing problem with compression. Those that have been here for a long time and received merit, salaries are falling below assistant professor level. The priorities have to be reworked. Tenured faculty has gone down in the last five years while student enrollment is up by 13 percent and administration numbers increased by 10 percent. Faculty is asking for a 3.5 percent salary increase and to raise the minimum salary for full-time lecturers? The outrageous situation here is that we have 70 full-time lecturers who are making $30,000 a year and one of our top priorities is to get them up to a living wage and a multi-year contract. People who have been here 10 years or more who have proven their worth shouldn’t be coming in early August and not knowing if they have a job. Negotiations have been over the course of 18 months and more than 50 bargaining sessions? At this point, 60 bargaining sessions. We are not at an impasse but we are making our priorities well-known. We hope to finish bargaining in the next month or so. This has dragged on for too long but we have been making some progress. We have signed agreements in terms of academic freedom, participation of joint governance and some progress on grievance language. There has been some movement. But we should have been done a year ago. With tuition being increased in the fall, has the administration said where that money is going? Again, I think the school puts a label on every dollar as if it is going to that place, but they have total discretion. It’s strange because this pile of money keeps growing. We want to see this money going to teachers, researchers and bridge funding if grants run out. There are lots of important things that could be done that the administration is not focused on. With the university receiving less state funds, where can the salary increases come from? This year, state funding went up, not down. Over the long run, there has been a decline. If you look at the most recent financial report, funding to the school from the state has declined but has been made up for by tuition increases. If you look at last year’s financial report from 2012-13, tuition went up $55 million and contributions went up $220 million. Overall, contributions have been increasing. What has been the feedback from students? I left class today and my students were wishing us luck for the strike next week. Students seem to appreciate -- Chicago is a union town -- the issues, and when they see how lecturers are being treated, they are strongly sympathetic. If an agreement is not reached and a strike occurs, what are the next steps? Well, we are back to the bargaining table next week and we are hoping for the strike to motivate the administration to action - to take this seriously. It’s almost as if those at the top have not been taking this seriously and have left the issues to the bureaucrats. Our basic concern is that we are striking now, but want to get this done and avoid any shutdown later in the semester when it would be disruptive. Is there pressure from faculty at other campuses to avoid a strike? No. They understand our situation and are being supportive. Is the university model broken? I think that we need to re-attune our administration to the mission of a public university. We have a mission for excellence and that is where we need to be. Maybe they have been over-concerned with finances during the recession but it is time to put this back in line. The school is flush with money so it’s time to move forward and do what we need to do. 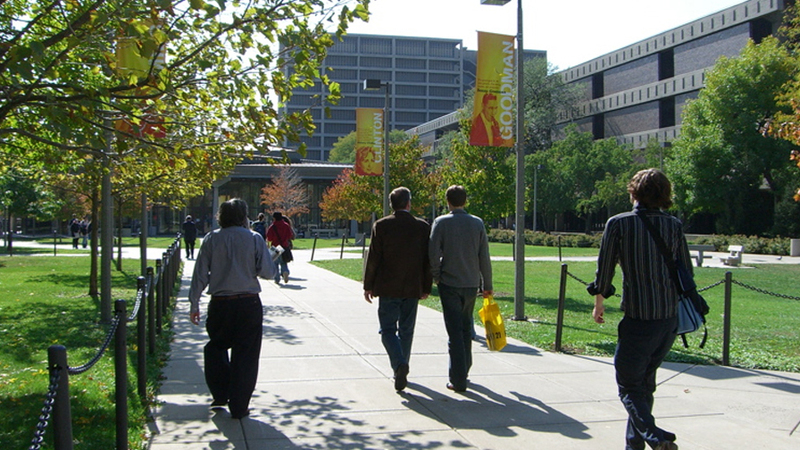 Read a statement from the University of Illinois Chicago regarding a potential strike. "The University values its faculty and has offered a fair contract to each of its collective bargaining units. We will continue to bargain in good faith, now with the help of a federal mediator, until a settlement is reached. To date, a tentative agreement has been reached on 14 articles for the tenure system faculty and 15 articles for the non-tenure system faculty. We have additional mediations set for both groups tomorrow and again next Friday. The University must be fiscally responsible in how it expends resources, especially with declining public financing and the need to make sure higher education is affordable for our students. The University believes that a work stoppage or strike is not in the best interest of the faculty, the University, or our students; however, we acknowledge the faculty’s right to strike under Illinois labor law. The University has created a website, facultycollectivebargaining.uic.edu, to inform our campus community of the status of negotiations and answer questions relating to a possible strike."